“We can, without any anxiety, trust them to pull together what they have heard,” he said. 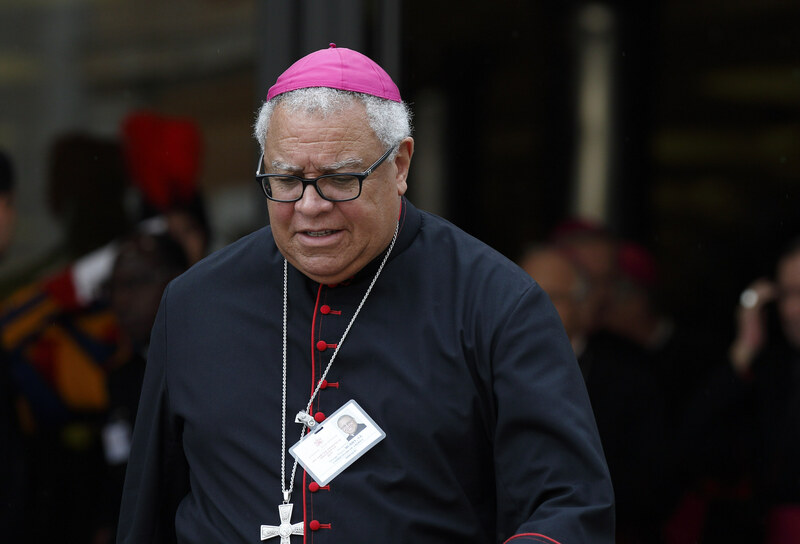 Bishop Murry also offered several practical suggestions that could aid future synods. In response to an intervention by Archbishop Paul-André Durocher on the role of women in the church, Bishop Murry said, “We have to move from talking about inclusion to acting in different ways.” He said he supports a liturgical or theological commission to look into the possibility of women as deacons. What is your experience of Pope Francis at the synod? On the first day, he was at the door of the Synod Hall, and he greeted each of us individually. He sits with the synod presidents, and it was very clear on the first day that the synod delegates could walk right up to him and say hello and speak with him. He was very open to that. When we have our coffee break, he comes down and just talks to people. The rest of the time he sits there and listens to the interventions of the delegates. He hears directly from us. You see him listening. He doesn’t make comments; he listens. His presence is a strong presence; it communicates he is actively involved in this process. Some participants have expressed concern—even “anxiety”—about the outcome of the synod and its potential effect on church doctrine. Do you share that anxiety? I don’t share that anxiety. The pope has clearly stated, on more than one occasion, that Catholic doctrine is not going to change, and that it’s one of his responsibilities to maintain the integrity of doctrine. He and others have been talking about the issue of practice. Can we find ways to be more open, more receptive and more welcoming to people who don’t fit into standard categories? That’s the essence of the debate. Some say: You can’t adjust the practice without influencing the doctrine. Others say that you can maintain the doctrine and adjust the practice. I would be in the latter category. It’s a matter of theological debate. One of the missing pieces in the synod is that we have not had presentations by theologians, biblical scholars, canonists or cultural historians, to get a broader view of that doctrine, what that doctrine has meant over time, and what it can mean in terms of the future. We need to do that before any decision is made. We’re talking about marriages that, for whatever reason, have fallen apart. What can we do to help them feel that they are in fact part of the church? Is Communion realistic or not? Does giving them Communion under certain circumstances undermine the value and truth of the doctrine? Those are the complicated questions which I just don’t think we can answer in three weeks. A letter from 13 cardinals expressed concern that the synod process “seems designed to facilitate predetermined results on important disputed questions.” Do you share that concern? I don’t. One bishop who has attended a number of synods told me the major complaint he heard from bishops in earlier synods was that there was not enough time structured into the process for conversation, interaction and an exchange of ideas. The real work of this synod happens in the small group discussions. I don’t know how “predetermined results” could emerge from the small groups. They have their own ideas they are expressing. Bishops from past synods have told me that this process is the most contributory. What was your reaction to seeing two U.S. cardinals sign the letter? Have you talked with them about it? There seem to be a number of letters out there. One letter had two Americans on it, and another had only had one American. So I don’t know. The Americans have not talked about it as of yet. I don’t know if we will. Adolfo Nicolás, the Jesuit superior general, is in your small group. What is that like? He brings an awful lot of experience to our discussions: from the Society of Jesus, from his time in Japan, and from having conversations with people all over the world. In any group you have people who are frequent talkers, people who are listeners. Father General is quiet in that he listens very carefully to the conversation. When he does speak, he says something that goes right to the point. Tell me about the presence and contribution of the seven lay men and women auditors in your small group. It’s been very good. They bring a different perspective. There is a husband and wife who have lost two children. They talked about the pain of that experience and the support they found in their parish community. There are two women—from Canada and New Zealand—who have been involved in a large number of programs for evangelization and adult counseling. There is a gentleman from India. He is very clear in articulating the differences between the Western view of marriage and the view of marriage in India. They don’t hesitate to participate. Can you imagine a greater role for lay people in the synod? Yes. There was some discussion early on about whether lay people could vote on various propositions. The decision was made that they were not going to vote because it is not a synod of bishops and laypeople; it is a synod of bishops. But we would do well, as we go forward, to have more lay people involved, to get even more ideas and perspectives. In an intervention, Archbishop Paul-André Durocher of Gatineau, Quebec, proposed that more decision-making roles in the church should be open to women, married couples should be able to speak in homilies, and the church should consider the ordination of women as deacons. Has that intervention been discussed among bishops? Yes. Different bishops have talked about it. There has not been an organized discussion about it, but there has not been an organized discussion about any of the interventions. That’s one of the problems with the synod format: When he made that intervention, the president said, “Thank you very much,” and went onto the next person. There wasn’t time to discuss it. If we did discuss it, we would not have been able to get through the 270 bishops and 57 lay people, unless you are going to extend the synod to five or six weeks. What is your reaction to the intervention? I think what Archbishop Durocher was saying is that we have to move from talking about inclusion to acting on inclusion. That’s a very good point. Women are involved in the church in a variety of ways, but are women in decision-making roles? That’s where we have to move from talking about inclusion to acting in different ways. When you talk about women as deacons, some people immediately say it’s the first step to women as priests. The pope has clearly stated that he does not see any way that we could move in the direction of [women priests], but that doesn’t mean we could not consider the possibility of women in the role of deacon. We could have a liturgical commission, or theological commission. It would be a wise idea to look into it, to learn more about it and then to present a proposal to the pope to say there either are theological problems or not; and if not, let’s move forward. You have said your small group was “trying to find the right language” about family. Have you been successful? The main task for this week is to find that language. We haven’t yet found it. Some of the difficulties stem from cultural differences. For example, we were in a conversation about divorce and the effects of divorce on a family, especially children. One of Filipino bishops pointed out that there is no legal divorce in the Philippines. If people separate, sometimes they surreptitiously remarry. That is very different from Australia, Germany and the United States, and we have representatives of those countries in our group. So the struggle was: How can we say something, and what kind of language can we use, to make a contribution to promoting and strengthening families in Australia, Germany, the United States, and the Philippines? Would it be of help to the synod to hear directly from divorced and civilly remarried persons, and gay persons? It certainly could be considered for an upcoming synod. Yesterday the Holy Father talked about how important it is to listen and to open ourselves to hear those around us. It was a good point, because it is easy to think that we already know. You have to be humble enough and quiet enough to listen to someone else, to hear their life story. Inevitably some people will object to that idea, mainly on moral grounds, saying these people are living in “irregular situations” or even “living in sin.” However, we need some way of hearing these voices. It may be having someone come and speak to us. It may be establishing a committee to go and speak to a group of divorced and civilly remarried Catholics, or a group of gay Catholics—who are in relationships or not—and bringing that information back to the synod. But I do think we need to hear those voices. In your intervention you described an increasing number of “new family structures” and said the church needed to reach out to these families. What concrete ideas do you have? The layman who directs the office of family life ministry in my diocese has developed a new program working with women who have had an abortion. A number of pastors are working together on a group for divorced Catholics, to let them know that they are still a part of a church, and we can help them as they grow. A couple months ago, before the “motu proprio,” my diocese eliminated all fees for annulments. Oftentimes you want to touch someone’s life but it’s hard to get in touch with them because they are not regular members of the church. That’s why, for example, when we eliminated the annulment fees, we made an announcement in the diocesan paper, put it into [parish] bulletins, put it on the website and encouraged the secular press to put out this news. We’ve gotten an enormous response. People said: I put it off. I thought it cost too much. I didn’t know what it was about, but now I’d like to start this process. What is your reaction to Pope Francis’ speech yesterday, on the 50th anniversary of the Synod of Bishops, in which he reiterated his call for a “synodal” and “listening” church? It was a major statement of how he sees the church and where he wants to lead the church. He is very concerned about, and puts great faith in, the strength of consultation. He believes the Holy Spirit is active not only in the pope and the bishops but also in the people, and that, walking together, we can find the path that God has laid out for us. I thought his point yesterday is that we do need to trust each other and allow the Lord to guide us through the Spirit which lives in each one of us. Pope Francis again emphasized the important role of bishops’ conferences in addressing local issues. Do you think that conferences could be empowered to deal with contested Synod issues? He also said there must be unity, and one of the major responsibilities of the pope is to be that source of unity for the church. I don’t think you can realistically have individual conferences making decisions about major issues without causing widespread conflict and confusion. If one group of bishops were to decide they are going to permit divorced and civilly remarried Catholics to go to Communion under certain circumstances, that would have an effect on other bishops’ conferences. You have to make a judgment on the weight of the issue. A major issue which involves church doctrine, church history and church tradition, like the Communion issue, would need to be discussed on the international level. The pope as supreme pastor would need to make a decision on it. What is your sense for what the Holy Spirit is doing in this synod? The Spirit is very alive in the small groups. In listening to what people say, the first thing that attracts your attention is the sincerity with which people speak. The second thing is the generosity, the concern for the whole church and what can we do to build up the church, the word of God and the presence of Christ. I see the Holy Spirit alive in these groups as we are yearning for what we can we do to stop the self-destruction, the wars, the racism, the sexism, all the things that limit people. What can we do to lead people beyond consumerism and materialism? How can we help men and women to be more concerned about others? How do we instill that in people and help them to grow? How would you judge the synod as a success? It is completely unrealistic to think that this synod, in three weeks, is going to come up with something that is going to make a dramatic change across the world in family life. This synod either is or should be the opening of an ongoing process to look more deeply at these issues and to find more constructive ways of contributing to the common good and responding to problems. The synod would be a success if we can establish some basic principles, put down a firm foundation, and then over time, continue to gather as bishops to build on that foundation. Asking for the perspective of lay people at synods would be a huge step forward! Ordaining women as deacons would also help the church develop leadership among the women. The church suffers for lack of women's leadership and women's voices in homilies.